Sharing of images, iframes (youtube, vimeo, etc), HTML5 videos or any HTML content in new tab or in new window with specified width and height. 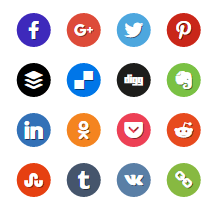 Share to media in 15 most popular social networks: Buffer, Delicious, Digg, Evernote, Facebook, Goolgle+, Linked In, Odnoklassniki, Pinterest, Pocket, Reddit, Stumbleupon, Tumblr, Twitter and Vkontakte. You can easily share specific image, iframe, HTML5 video and any HTML content or you can share full page with anchor to specific media – with auto scroll media to the visible area of the page. You can share any html element by adding class s4ys-share. Conversely class s4ys-no-share prevent sharing. Manual mode: After every ajax page update you must call inicialization of Smart4y Share Media Plugin. It is possible to define media selector for specific page? video: All HTML5 videos in the page, including videos generated over wp video shortcodes. [src=youtube], [src=vimeo]: Youtube or Vimeo iframe videos. Fixed: Visibility Smart4y Share Media function in global context.